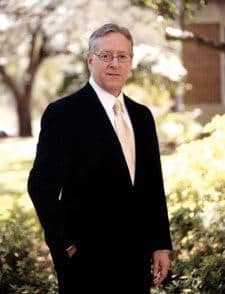 Yesterday, Rondall Reynoso, a former professor at Louisiana College and the publisher of the popular website Faith on View, published a series of secret, alleged audio recordings of the embattled and controversial LC President Joe Aguillard. As the recordings make abundantly clear, Aguillard allegedly considers himself to be much more than the President of the once-venerable institution. Allegedly, according to Aguillard, the college is not even “an employer;” that instead, he is– a brazenly false and comically intimidating statement that should not only immediately result in sanctions by LC’s accrediting body, the Southern Association of College and Schools (better known as SACS) but should also raise a series of red flags with the Internal Revenue Service, the Louisiana Attorney General, and the Louisiana Secretary of State, each of whom are duty-bound to ensure Louisiana College’s compliance with laws governing the operations of tax-exempt, tax-deductible 501c(3) religious organizations. President Aguillard’s alleged comments, if authenticated, should result in his immediate removal and termination as President and may potentially expose Louisiana College to significant legal, constitutional, and due process challenges. With Professor Reynoso’s permission, I have reposted the entirety of his report (bold mine): Listen to the audio, exclusively, on Reynoso’s site. There are few characters in Louisiana Baptist life that are as controversial as Louisiana College President Joe Aguillard. For some, he is the near messianic figure that led the redemption of Louisiana College from liberal heresy to conservative orthodoxy. That narrative began to fall into question, beginning in 2011 and gaining steam until 2013, when theological conservatives began to question Aguillard’s leadership. I was the first of the “New LC” crowd to do so in 2011 with my Open Letter to Louisiana Baptists. But in late 2012, a board member called for Aguillard’s resignation and two Vice Presidents filed whistle blower complaints against Aguillard on ethical grounds. The Board then hired a law firm to investigate the allegations. The firm found that Aguillard had behaved unethically and that there was ample ground to fire him. “There is no freedom of speech here,” he said. “I didn’t make that up. That’s the law. When a student says, “I have freedom of speech…” We have three attorneys who will laugh them into the ground because there is no such thing here. Despite all this, the Board, unofficially led by Louisiana Baptist Convention Executive Director David Hankins, chose to close ranks behind Aguillard publicly proclaiming that Aguillard was a good and Godly leader. Though privately, Hankins told a Board member that Aguillard would “remain President unless he was found in bed with a live boy or a dead girl.” To invoke the words of corrupt former Louisiana Governor Edwin Edwards, who had only recently been released from prison and was still on probation, was not a ringing endorsement of Aguillard’s ethics. Further, it illustrated that for Hankins small issues like dishonesty and misappropriating college funds were not a major concern. Indeed, even the fact that Aguillard’s behavior had cost the college their largest donor in history was not enough to make Hankins withdraw his support for Aguillard. Why is Hankins so supportive of the embattled President? To be honest, I can’t figure it out. This is a President that is so manipulative and controlling that when he became President he asked the IT Department about being able to listen in on employee phone conversations, which they refused to facilitate without a warrant. The one thing that is clear is that Hankins has chosen to support Aguillard at almost all costs. Despite the public rhetoric about Aguillard, behind the scenes he continues to behave in ways that most of us would find reprehensible. 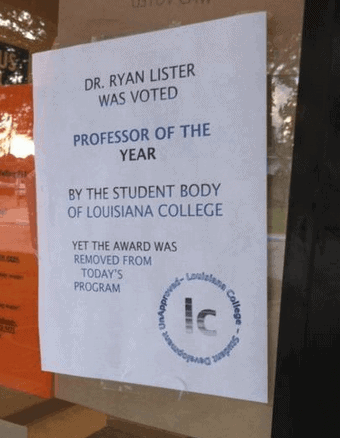 Last Spring after Aguillard had decided to get rid of four faculty members from the Department of Christian Studies one of those faculty members, Ryan Lister, was voted by the student body as the Professor of the Year. This was an embarrassment to Aguillard so he cancelled the award. Some students found out about the cancelled award and distributed flyers exposing it. To Aguillard, this was a tremendous violation and he set about finding out who had done such a thing. In the course of this, he called an employee into his office who he thought may be able to help him narrow his search. This employee had seen a great deal of concerning behavior at the college and chose to record the meeting for protection. What, to me, was interesting is how explicit Aguillard was about attitudes that many of us knew he held but which he rarely stated explicitly. There is no doubt that the President has authority over this employee. But, I think saying that the employee should be “proud to jump at his request” and show “1000% loyalty to whatever he does” shows a deeply flawed heart. Aguillard further explained to this employee that it was sinful to voice personal opinions about non-confidential college issues in private conversations and that loyalty should be to him not the college. Even for someone like me who has seen Aguillard in meetings with closed doors, these blatant admissions of his supreme authority and his disregard for the rights of students is surprising. Further, Aguillard clearly articulated that his priority in employment was personal loyalty to him rather than competence. It should be noted that this employee was loyal to the institution and had not done anything wrong. But, the employee did feel that it was never made clear that “1000% loyalty to whatever he does” was the requirement for employment rather than competency. But, Aguillard determined that he would make this clear to all employees before they signed their next contracts. Do I believe seeing the Joe Aguillard that exists behind closed doors will make a difference to Hankins or those on the Board of Trustees? No. Do I think it will make a difference to John and Betty Baptist sitting in the pew on Sunday? I’m not sure. I think, for many, their opinion is set that any opposition against Aguillard is tantamount to Satan decrying the Messiah himself. But, I pray that there are still some who would question why David Hankins and the Louisiana College Board of Trustees have chosen to back a person who behaves this way. I truly am curious. Do non-Baptists, especially those living in the Alexandria/Pineville area simply don’t care what happens at LC, or is afraid to denounce Aguillard? I appreciate your attention but religious and education leaders voices are needed. I think Mr. Aguillard gives Baptists a bad name. So glad I am not one. My husband is an LC grad but we withdrew all of our support when Aguillard became president and started all of his shenanigans. I am an Alexandria resident who graduated from LC in ’66. Son graduated from there in ’96 & daughter in 2001. It enjoyed an excellent, non-controversial reputation before this fellow came to power. None of us would give this school a dime now.